"Write down your goals and plaster them all over your home." You know very well that real life bears no resemblance to the beautiful staged life posted on Instagram and Facebook. One of my favorite heroines is Celeste Barber, a comedian from Australia who does wonderful parodies of just about every kind of silly and not so silly thing you can imagine. When you need a good belly laugh, I strongly suggest you check her out. Something you might not know is that even those of us who were once upon a time, are still or are again successful, have bad days, horrible fits of anxiety and toe nail curdling melt downs. Yes, we do. Most of us do not share those things in public, but it is true. Don’t beat yourself up when YOU have a bad day and are wondering why you ever thought being an entrepreneur was a good idea. It is the toughest job in the world. Rejoice in human frailty and join the club. Nothing beats fear better than work. Pull out that to do list, hunker down and just tackle the first three things on your list. I don’t have time for fear when I am busy. Being busy forces me to push all nonsensical ideas about failing away. Believe. This is probably the hardest. You are brilliant. Your ideas are brilliant. Your clients are waiting breathlessly for you. You must believe in yourself a million percent. There is no one else on the earth that can believe as hard in you as YOU. And if you can not believe in YOU or your belief is wavering the teeniest bit, pay the money and get expert help. Post your big hairy goal everywhere. When you work for someone else, it is never an issue; but when you work for yourself, being focused on your ‘BHAG’ is paramount. Write down your goals and plaster them all over your home. 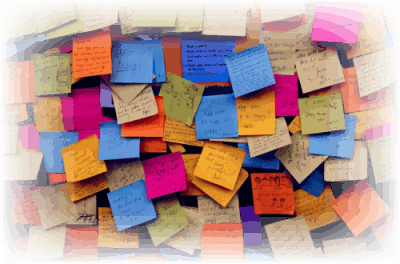 Post stickies in your office, your bathroom, your kitchen and where ever you need to be reminded about what you are striving for. The idea is to be constantly reminded. Get mad and immediately let it go. This is a very, very important thing to learn. (I am still learning it.) So very little is that important. Nothing will really matter a hill of beans in three to five years. Keep it all in perspective. So, in the moment, get mad; and then let it go. Realize it is never about you. The fact that the prospects don’t call you back on time, your computer or phone or printer died, the supplier failed to deliver, or the employee did not show up is rarely, if ever, about you. Nobody wakes up in the morning and says, “I am going to go out of my way to make Char’s life miserable.” Life happens to everybody. Emergencies happen, equipment breaks down, bad stuff happens to other people. Remember that and breathe. Work hard; have fun. If you are not having fun while you are doing it, why are you doing it? Don’t forget to make some time for yourself. All of us are different. It may be an hour or two a week – a date with the husband, a special night with the girls, an afternoon for a pedicure, a daily 30 minutes in the garden. Whatever you need, don’t forget about the “you” piece. Keep the faith. Well that is trite, isn’t it? I know. But nobody said it was easy, because if it was, lots of people would be doing it. Again, if you have trouble keeping the faith, find some expert help to give you sanity and clarity. Grind. Your tribe really is out there. It’s up to you to find them. Take action every day to find your tribe. It is not about trying something once and giving up. It is about setting a plan, sticking to the plan for three to six months, reviewing the results and then adjusting. Grind, grind, grind. Accept that failure is part of the process. Okay, this one hurts. None of us wants to admit we screwed up, lost money or worse. But the truth is, to be successful, to be really successful, you are going to fail – many times. So, put your big girl pants on, accept the loss and move on. It really is that simple. I have written before that having your own business is one of the toughest gigs going. It is not for the faint of heart. Every single business owner has daily periods of anxiety. Use one or all of these tricks to get past your periods of stress. That is how the winners stay in the gold circle. NOTE: If you missed Part 1 of “It’s True! It’s all in Your Head!” – click here.